Delivered Cheyenne 15/4/43; Smoky Hill 22/4/43; Presque Is 10/5/43; Assigned 511BS/351BG [DS-N] Polebrook 26/5/43; transferred 334BS/95BG [BG-H] Horham 16/6/43; on 16/9/43 with Bill McPherson force landed RAF Harwarden; taxi accident with Albt Rummans Metfield 13/10/43; Missing in Action (20m) Missing in Action Schweinfurt 14/10/43 with Capt Bill McPherson, Co-pilot: George Byrnes, Navigator: Bill Prochaska, Bombardier: Austin Pritchard, Flight engineer/top turret gunner: Leon Ciaccia, Radio Operator: Tony Kosmala, Waist gunner: Morris Eckard, Waist gunner: Henry Rhodes (9 Prisoner of War);Tail gunner: Fred Nunnold (EVD-and returned); #3 feathered, gear down, then crashed between Rheims & Sedan, Fr. Missing Air Crew Report 855. 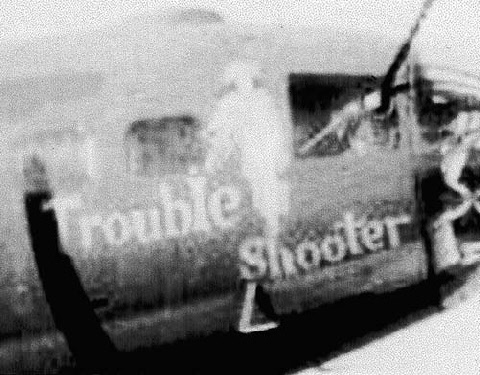 TROUBLE SHOOTER.